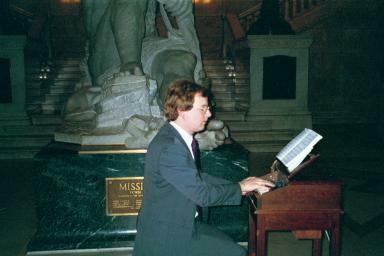 The Tower Bell Foundation holds bell concerts regularly at Minneapolis City Hall-Hennepin County Courthouse. 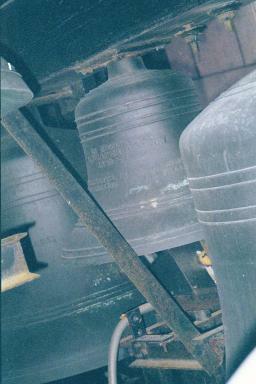 The Foundation is also heading up an effort to expand and/or renovate the bells. The Foundation is chaired by Tony Hill, who also produces the concerts. You can look up the concert schedule online here or find out about other activities of the Foundation. Our concerts are possible through the cooperation of the Municipal Building Commission, the joint city-county entity that manages the building. 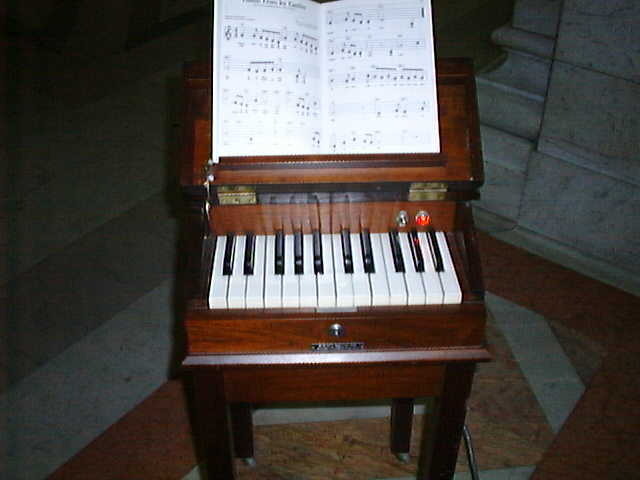 The largest bell in an instrument is called the bourdon. The bourdon in our tower is 5 feet 8 inches in diameter and weighs 7300 pounds. It sounds the note Bb below middle C. Naturally, the politicians who built the tower dedicated it to themselves. Standing next to the bourdon is Jean Mellem, one of our volunteer chimes players. 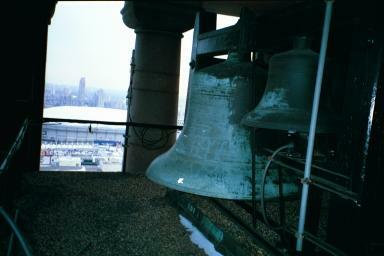 Below is another view of the same bell with the Hubert H. Humphrey Metrodome in the background through one of the four open colonnades of the City Hall tower. The bell at center was given by the Dayton family in memory of David Draper Dayton. This was part of an addition of four bells, the other three of which are in the picture at the top of this page, done in 1923-24 which added to the range of the bells sufficiently to permit the playing of the national anthem. Another member of the Dayton family, Donald C. Dayton, led the next major renovation of the bells in 1972. 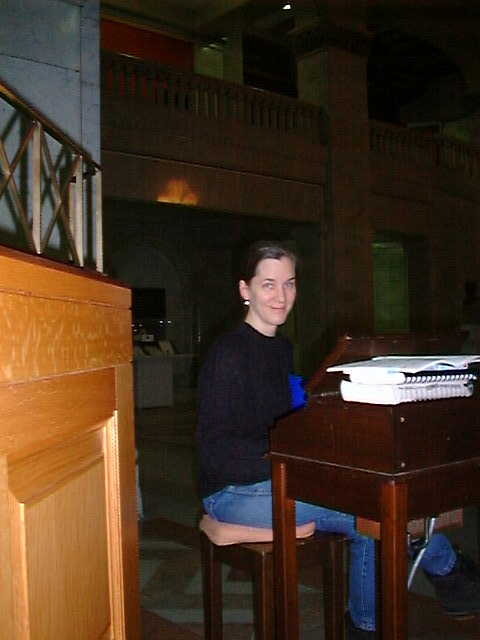 The bells were automated in that round and are now played from an electric keyboard (below) from the Rotunda. Tony Hill, Chair of the Tower Bell Foundation, plays "The Star Spangled Banner" at the conclusion of the New Year's concert in the first hour of the year. 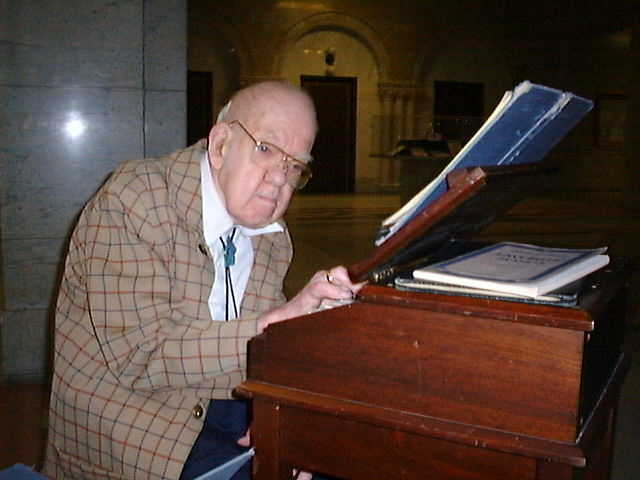 Edward Auld played the bells of Minneapolis City Hall-Hennepin County Courthouse from 1924, when he was 12, until he became too infirm to continue playing in 2000, more than 75 years later. His father, Hank Auld played the bells from 1912 until his death in 1969. 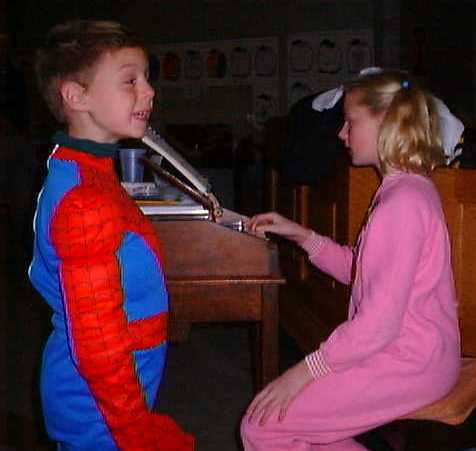 Edward was still scheduled to do a dozen concerts a year as recently as 1999. 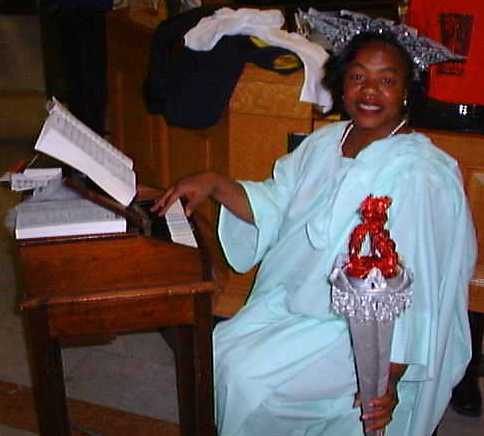 This picture was taken on Flag Day, June 14, 1999. Edward's final performance was on February 21, 2000, for Washington's Birthday. Edward died on January 25, 2001, about a month after the Tower Bell Foundation (then known as City Hall Carillon Committee) announced his retirement. 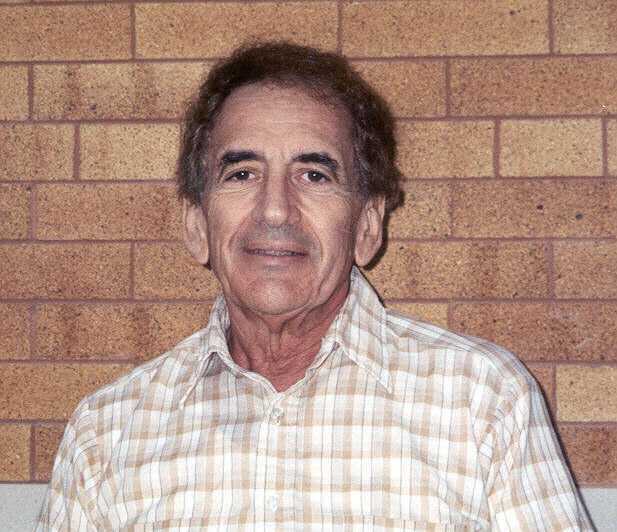 Les Block is a professor emeritus at the School of Public Health at the University of Minnesota. He has been Vice Chair of the Tower Bell Foundation since its inception and has been Associate Producer of our concerts since 1990. 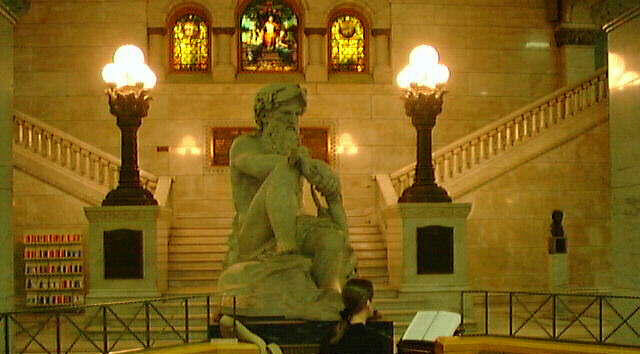 The bell player has one of the most opulent worksites anywhere, surrounded by marble, stained glass, and sculpture. 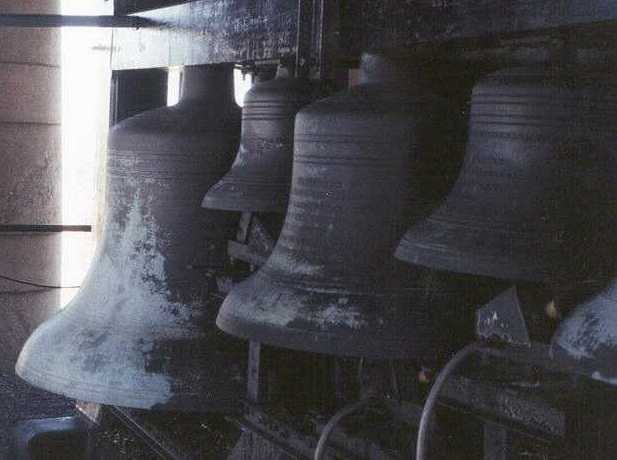 The bells have a range of an octave and a fifth (bearing in mind that 'fifth' doesn't mean the same in music as it does in mathematics), a total of twelve "white notes"
There are three "black notes"
Until the U.S. Courthouse was built in 1996, it was impossible to hear the bells on the sidewalk below the tower. Now the sound bounces off the Courthouse and can be heard on the 4th Street side of City Hall. 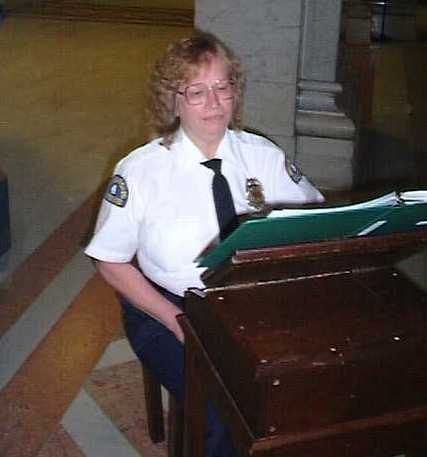 It is possible to prop open the 4th Street doors to City Hall and hear this reflected sound while playing the bells. (The amplifier must be turned down as well.) This causes an odd 1.5 second delay for the player. 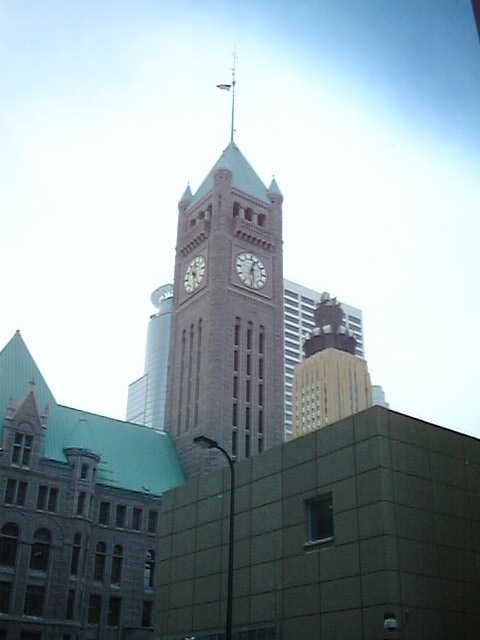 The building is deeded right down the middle between the City of Minneapolis and Hennepin County. The side of the building along 3rd Avenue is the city side, and the side along 4th Avenue is the county side. The property line passes right through the belfry, meaning some of the bells are on land owned by the city and some on land owned by the county.